First picture from Texas. 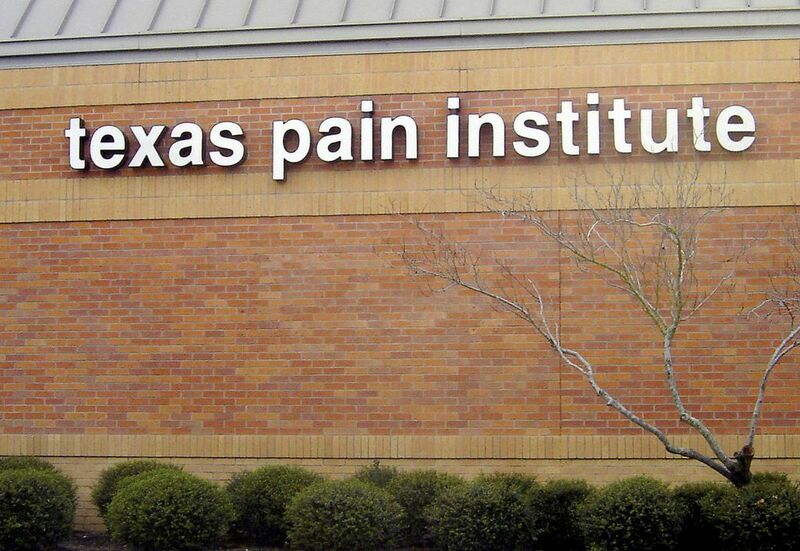 This is the Texas Pain Institute. 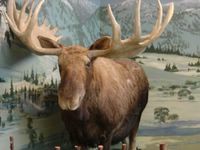 The Mrs. and I threatened to take The Boy here (or maybe to the Pinching Barn, or the Spanking Factory) if he was not good. 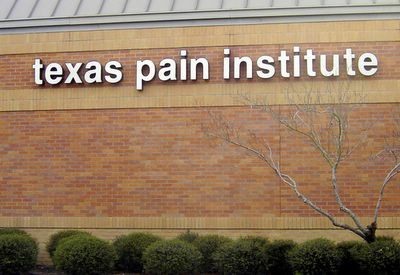 I would much prefer the sign say Texas Pain Relief Institute, since Texas Pain Institute makes me think they’re just in it for them, rather than the customer. It’s like flu shots – I’d much rather have a flu prevention shot. The Mrs.’ book is still online and available at Amazon.com at this link. Buy a copy, or, better yet, buy a dozen. Whoever bought a copy of "The Road" by Cormac Mccarthy, well, I bought a copy of that one, too after reading the description. Hope you like The First Seal - I think you will. If an alien were to come down to Houston, he would be convinced that the dominant form of life in this area is the Lexus Grandus. I have seen more big, shiny Lexuses (Lexi?) in Houston than in the entire universe. I think the Lexi come here to spawn, driven and fed by their symbiotic women who have own symbiote, the Cellus Phonus Motorollus Tinius attached firmly to their ear. Cars here in Houston are just that: new and shiny. In Fairbanks, the average car is 17 years old, been registered in six or seven states, and stays their until it dies. After it dies, it still stays there. And rusts. In Fairbanks, you could expect a car given as a Christmas present to be missing valuable components (say, a working radio). In Houston, I regularly drive by a Mercedes dealership which puts big bows on cars worth more than a house, complete with in-dash machines that manufacture steaming hot lattés out of gold powder and un-baptized children. But it’s just past Christmas, here, and although I did not get a Porsche that trims my toenails and shaves my back while I drive, I did get the best gift of all. See, The Mrs. sold her hair to buy me a watch chain, but I sold the watch to get her hair combs. This is patently unfair, since her hair will grow back, but my watch chain won’t grow a new watch. Stupid Magi. Leading up to Christmas, The Boy was nearly insane with “little boy glee and anticipation.” Since The Boy is six, well, all his dreams can be met, and rather easily. He requested a Hot Wheels play set. The Mrs. and I, after quaffing a beer or two, got on our respective computers and began shopping on Amazon (where, by the way, you can get her book) and other points ethereal. I found a play set on Amazon, a big, hulking, four story parking garage complete with its own interstate highway passing by. It looked like it was made of concrete. It wasn’t Hot Wheels, but rather no brand was specified. That worked. The cost of the beast was $19.47, but shipping was $11.07. Nevermind. I didn’t have to fight the crowds at the malls. (There was no free shipping because this was one of Amazon’s affiliates, not Amazon). To make the utter Scrooge-ness of the holiday complete, I paid with Amazon gift certificates that I get from my credit card. When finally it came time to open the presents, The Boy enjoyed them all, especially those from his Grandparents (hey, it’s good to be six). 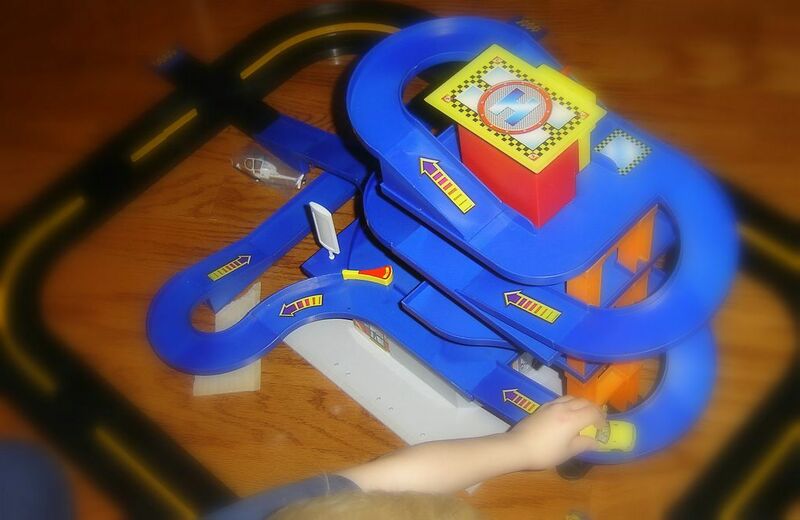 When he opened the Hot Wheels play set off brand toy car set, he was thrilled. After playing with a multitude of toys, it was time to erect this hulking monstrosity of a toy. First, it had about 73,421 pieces (some assembly required). All of them were plastic. The instructions had no words, and were drawn in a cryptic fashion. Some pieces of road connected to the next piece with a doohickey. Some had a thingamabob. I decided to do what all good dads do at this juncture: Throw the instructions away and push on. We finally got the structure together, but I had to dig the instructions out for the important work of decal placement. The cultural differences between wherever made this (Taiwan, in this case) and the US was apparent, since, as this was a mall, the only things available at this particular mall were “Toys, Seafood, and Gifts”. Me, my mouth just waters as I think of going to the mall for mall seafood and unspecified (presumably generic) gifts. As I was putting the parking garage structure together, I noted that there was only one way to get from one level to the next. The instructions clearly indicated that this ramp had a “down arrow only” decal on it. I kept my observation to myself. Soon enough The Boy piped in: “Hey, if all the arrows point down, how do cars get up?” I smiled a deep, nerdy-dad smile deep inside my nerdy-dad soul. The Boy has The Knack. As he began to play with it, the lack of up arrows was quickly forgotten. Cars don’t drive to the top, they are carried in the hand of a six year old, where they are accelerated by gravity to the speed of sound and shoot out onto the plastic interstate. Okay, if you're a guy, wouldn't you have killed and gutted Santa to get one of these when you were six? I have to admit, the mall is cool - it works like a charm. Plus, this mall has a helipad so you can pick up your squid and random gift and then fly off. I bet the helicopter has a doohicky that trims your ear and nose hair. I thought you would have learned something about using directions after your John Deere snowblower attachment project. Less beer, more reading. This is funny! I'm glad I stumbled across your blog. 1) Have people you know who've read the book post "customer reviews" on Amazon. That really does help. 2) Go for the guerrilla marketing. When you're in a bookstore, find her book and turn it face-out on the shelf, if it was spined, or even better, casually drop it on the "new fiction" table as you walk by. It does work. I am not a guy and I would have loved that toy! BTW, the book is on its way. I will post my opinion after I read it, for sure! How many books to I have to buy in order for you to move back to Alaska? Perhaps the assembly instructions were in metric? I gotta have a backhair shaver and toenail clipper installed pronto. Good evening, Mr. Wilder. I have visited your blog this afternoon and I loved it. I loved the pictures. I have linked your site to mine a few minutes ago. Can't wait for the next post! I'm still putting together Christmas presents. Problem is that I was trying to use the instructions...Italian side. Oh the joys of father-hood. (and mother-hood) I have been up past midnight many times on Christmas Eve assembling "things". Thank you! The books up, and the comments are coming! Ummm, by my last count, 100,000 would do it (truth be told, 10,000 would do it, too). But start with just the one. Thanks! Like your stuff, too. I'll get a link up when I start the whole blog fixing (this weekend??) done. Listen carefully - put the instructions down. They'll just taunt you, what with their pretty pictures of nicely-assembled stuff. :) It's the best. Even better when The Boy and I worked it together. Well I am slow, but I have ordered two books. I am going to give one to my Dad. When I went on Amazon it said there were two new and one used available. So, perhaps I got the last two new ones! Is that good? Does that mean they sold them all, and are now recycling? Woo I am soo excited!